Airbrush tanning is a precise technique that uses a continuous flow HVLP wide point spray gun. Our certified airbrush artist can create a customized solution tailored to your skin tone so you look as natural as possible. 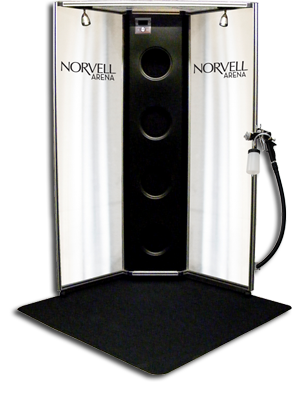 We use only premium, all natural sunless solutions from Norvell which are not only the freshest, but utilizes high quality, pharmaceutical grade DHA from France. We also prepare your body for the session with a PH balancing spray as well as a post hydro-firming spray which moisturizes your skin and locks in the color.